We often get asked the question – which day of the week is best to send out mass email? Not an easy question to answer as it's really dependent on the type of email addresses in your database. Are they business emails or are they personal emails? Are you sending to realtors and brokers or are you sending to prospects and leads? Are you looking for a call to action? Is it a time sensitive event, such as an open house or VIP event on the weekend? Regardless of the size of your database it requires some testing to see what works best for you. The day of the week is important, but the time of the day that you send should also be part of your strategy as often this can be more important than the day sent! At Lasso, we recently did some testing and got some great results – one of the highest open rates for a mass mail. Following was the scenario . . . It was time to send out our quarterly company newsletter – New Developments. The average open rate for the real estate industry is about 20% – anything over that is considered good, but we wanted to see if we could do better. Our database of clients, as you would expect, is home builders, developers, and real estate sales and marketing professionals. In the past, we've typically sent out emails mid-morning. This month, we decided to see what kind of results we would get by sending between 3:00pm and 3:30pm. A time, when for some, much of their work for the day is done and they may be looking for a quick break from work. We thought that maybe the recipients of our email have a little more time to open and read email at this time of the day. The result – a 35% open rate! Will we always see this kind of result? Maybe not, but the point is, don't be shy to try something different, and continually try to do better. There's no question there are some basic email best practices that you can follow to improve open rates – a creative subject line, consideration given to who sends the email, a good balance of images, etc. – but there are other factors – day of the week, and the time of day. If you have a weekend event happening, Friday night may not be the best time to communicate this – but Thursday afternoon with a reminder on Saturday morning, may work. 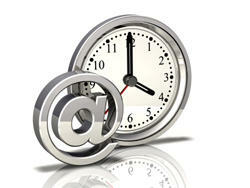 It's a common thought that it's ineffective to send email from about 10:00pm through to 9:00am. Mid-morning during the work week is not a great time either – most people are more focused on work-related activities than personal email. The late afternoon into the early evening may be the best time for business-to-consumer emails. Think about when you open emails, or think of when you don't open them, and why. Don't be satisfied with average open rates, challenge yourself to see if you can do better . . . I bet you can!